Who could blame her? I bet it's comfy on all those blankets! I don't have internet on my phone either. I'll probably get it when I get a job though and my first actual cell phone contract. I went from my parents' plan to pay-as-you-go on which internet is stupidly expensive. Emmy always makes me brings a nice calm start to my day. Those furry babies of ours always think that freshly folded or laundered blankets are especially for them! My Oliver is a long-haired cat and his shedding is unbelieable. Do you have the same problem? Princess and the Pea! I didn't get a cell phone until I was a Junior in college and it was only because I was moving into a house where no one else wanted a land line! I'm on the internet all the time so it's probably good I don't have it on my phone too! Emmy is so cute. And I bet those blankets are really comfortable! You know what? I still don't have a cell phone. I guess I'll get one when I need one. Cute pic! I've never looked at LT on a mobile device. Emmy looks so regal in that picture! Something inherent about cats loving piles of blankets! I love Tuesday's because I know I'm going to get my "Emmy" fix. When do you get the new kitten? Emmy looks so comfy on those blankets! My cats done the same with some quilts stacked in a corner of the den. They have to be washed again before we store them though. They're covered in her hair! *sigh* I will never get tired of looking at cute animal pictures. I just love Emmy pictures. It definitely adds to my week. 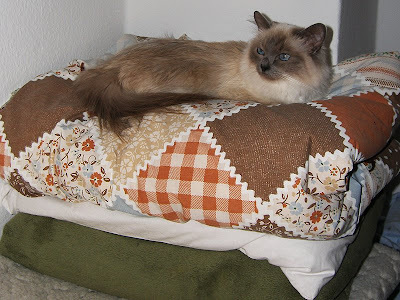 She does look like the little princess that she is on top of those quilts. Too cute. I love my Blackberry and could never go back to a regular phone. I've looked at LT on it, but don't use it too much. Lenore, I figured out the misdirection of clicking on my name. seems I typed my web address as xxxxxxx.BLOGPOT instead of BLOGSPOT as all Blogger address are. I tried it with some other Blogger sites and if you make the same error, they all go to that bible site. That's exactly what I thought of before I read what you had written. She looks like she's ready declare that someone had better remove that pea! I've had a cell phone for a while, and I know it CAN browse the internet and email, but I refuse to pay extra to do it! !